This is the first entry in a series featuring Detective Inspector Peter Shaw and his Detective Sergeant Bob Valentine in Norfolk, England. It’s a police procedural with a “locked-room” element to the main plot: A line of cars is stranded in a snowstorm on a desolate coastal road. When help arrives, the driver of the first vehicle in the convoy is discovered dead at his steering wheel, murdered seemingly under the noses of the other drivers stranded behind him. With no footprints in the snow, Shaw and his team are stumped as to means and opportunity. As to motive, however, the police begin to uncover some very convoluted relationships between the other drivers–supposedly all strangers to each other–in the convoy. Complicating matters are two other murders in the immediate vicinity, one corpse floating to shore on a toy raft and another found buried in the sand. Could all these deaths be related? You’d be surprised! The plot was satisfyingly byzantine, and the atmosphere deliciously chilling and bleak. But what piqued my interest was the back story of DI Shaw and his relationship with Valentine. Valentine is an older man who fell from grace and was demoted as a result of implied corruption in the fall-out of a failed investigation years before. His partner had been DI Shaw’s father, since deceased. Shaw Jr. wants to know the truth about this unsolved case, which involved a murdered child, and his father’s true role in the investigation. Valentine would like his name cleared and his position back, but suffers from resentment of serving under the younger man. A mutual lack of trust complicates matters even further, but over the course of the story each man begins to develop a grudging respect for the other’s detective abilities. One can tell that this back story will continue to develop in future series entries, which will keep me reading. This is a mystery which will appeal to fans of Charles Todd’s detective Ian Rutledge. Like Rutledge, the main character, John Madden, is a Scotland Yard detective struggling with shell shock in the aftermath of World War I. He is called to a small village in Surrey where an entire family has been murdered. As he works with local police, he is bothered by the meticulous planning that appears to have gone into the massacre and starts to suspect that this is not the killer’s first murder. With help from the local police constable, the comely female village doctor, and an Austrian psychologist, Madden slowly develops a portrait of the suspect: a former soldier and psychopath who is escalating at an alarming rate. He has his next victim picked out, and Madden’s challenge is to find out who and where before it’s too late. Although comparisons to Rutledge will probably draw Charles Todd’s readers to this title, there are major differences. Madden’s demons are a little more straightforward than Rutledge’s, and the overall atmosphere is more optimistic. Airth allows healing and happiness to dangle within his protagonist’s reach, whereas Rutledge’s fans often wonder when his creator is going to give him a break already. The psychological aspects will also appeal to fans of Jacqueline Winspear’s Maisie Dobbs series. Check the WRL catalog for River of Darkness. This is a completely serendipitous discovery which I feel fortunate to have stumbled across. This is a new Victorian-era murder mystery series, set in London, featuring a brilliant, eccentric detective with few social skills and his feisty young ward who gives him a run for his money. The most obvious comparison is with Arthur Conan Doyle’s Sherlock Holmes, especially Laurie King’s version with Mary Russell. The author does not shy away from this but rather seems to take great pleasure in inserting sly references here and there—such as a suggestion that Grice is Conan Doyle’s inspiration for Holmes! With all of the obvious similarities, I found this a refreshing, funny read and a good mystery to boot. It has more of a modern feel to it than King’s, or Conan Doyle’s, narratives. The great detective, Sidney Grice, is not nearly as likeable a character as Sherlock Holmes. He is rude, unkind, contemptuous and heartless. Loathsome as he is, the reader becomes quite attached to him (and his glass eye, which becomes a surprisingly successful running gag). His new ward, March Middleton, gives it right back to him without flinching, making their interactions entertaining and very often humorous. When the unfeeling Sidney Grice refuses to take the case of a penurious woman whose son-in-law stands accused of murdering his wife, March takes pity on her and offers up shares in a portfolio inherited from her father to pay the fee, provided she is allowed to co-investigate the case. Thus an uneasy and contentious alliance begins. March finds herself at odds with the conclusions drawn by Grice, and a battle of feminine logic and intuition versus cold reason and science marks most of the narrative. In the end both are right and wrong; it’s an auspicious beginning for this formidable team. The idea of my guardian having a vice was rather appealing. “But what is this vice?” I asked. “I can’t say I know, miss.” Molly screwed up her pinafore. “For it is a secret.” Her eyes filled and she scurried off. Check the WRL catalog for The Mangle Street Murders. Another post-WWI mystery series! This is the first entry featuring Jack Haldean, late of the Royal Flying Corps and a successful writer of mysteries. It’s pretty lighthearted compared to, say, Charles Todd’s Ian Rutledge mysteries or even Elizabeth Speller’s Lawrence Bartram series; in fact it’s almost a cozy and certainly of the English “country-house” style, in which there is a relatively small domestic circle of suspects. They all do share the need for the hero to look back to the darker days of WWI in order to solve a crime, however. In terms of optimistic tone and relatively angst-free protagonist outlook, this is more like Charles Finch’s Charles Lenox series. Jack Haldean has the war injury but also quite a sunny outlook on life—he’s glad the war is over and is basking in the normalcy and relative peace of a 1922 Sussex country village fete on a glorious summer day. His mood is jarred somewhat when he bumps into an inebriated and much disliked former military comrade, who is writing a book about his war service, in particular a specific incident during the Battle of the Somme which destroyed careers and created heroes. He vaguely intimates to Haldean that the event was not what it seemed—and soon after is shot dead in one of the fete tents in something of a “locked-room” conundrum. Suspects abound as it turns out that the dead man was possibly a blackmailer. Even Jack’s family members with whom he is staying in the country are not completely immune from suspicion. It becomes apparent to Jack, however, that something in the victim’s WWI service is the key, and he uses his military connections to get the bottom of it. Jack enjoys an amicable relationship with the police; the very competent Superintendent Ashley welcomes his amateur assistance gladly, especially as it pertains to the military angle. It’s a bit refreshing to be spared the friction among bumbling police and smarty-pants amateurs which is frequently encountered in mystery stories. Gordon-Smith is effective at conveying the atmosphere of rural post-war England and class and social conventions of the period. This book has something of the feel of Golden Age mysteries written by Ngaio Marsh and Margery Allingham; the reader can almost be convinced that the mystery was written during the 1920s rather than just taking place in them! I enjoyed this atmospheric and lighthearted “manor house” mystery, and I’m looking forward to savoring the next entries in the series (7 more at this writing). Check the WRL catalog for the book or the ebook! There have been a couple of posts about Craig Johnson’s Sheriff Walt Longmire mystery series on this blog. A recent post referred to the A&E Show based on the series, Longmire, so I’m following up with a review of the TV show. I’ve only read two or three books in Johnson’s Longmire series so far, but I really enjoyed them and was intrigued at what a TV show based on it would be like. The role of the titular Absaroka County, Wyoming, sheriff is taken on by Australian actor Robert Taylor. He looks and speaks exactly how I imagine Longmire from the books would, and this is what drew me into the show: aging, a bit cranky, set in his ways, gruff manner covering a rather soft heart. However, his character is a bit darker and more angst-ridden than in the books. His past is also murkier, with some dark secrets driving a major plotline which is absent from the books. This plotline necessitates more of a sense of inner torment and greater recklessness in the TV show Walt. His relationship with his daughter, Cady (portrayed by Cassidy Freeman), is explored in both formats, though the TV show cannot resist infusing it with far more Sturm und Drang than in the books. Longmire’s deputy, Victoria “Vic” Moretti, played by Katie Sackhoff, is in my mind quite similar to the character in the books. I haven’t gotten through all of the books, nor the rest of the TV show, but I’ll be interested to see how the relationship between Walt and Vic plays out and how it is treated in the show versus the books. Craig Johnson’s character of Henry Standing Bear, Walt’s best friend and oft-times liaison to the Cheyenne Indian reservation’s law enforcement and citizens, is happily present and accounted for here. His speech, mannerisms and stoic nature from the books are intact in the show, for which I’m grateful. He plays an important part in every episode. He is portrayed by Lou Diamond Phillips who I think does an outstanding job. Lucian Connally is the former sheriff who preceded Walt, and he plays a bigger part in the books than he does on the show. I’ve gotten through Season 1 and only seen him in one episode, but he was relatively true to life in his reckless cantankery. His nephew, Branch Connally, is Walt’s competitive deputy on the show, but this character does not appear in the books. His presence provides several storylines which were not possible in the books, but certainly add to the show’s dramatic and sexual appeal. Fortunately for the book lovers, major themes of the books are revisited honestly and regularly by the TV series: the ever-present tension between the Cheyenne on the reservation and the local Absaroke County residents; a sense of social justice attained or denied; man versus nature. Some of the plotlines are recognizable from the books, but much liberty is taken with them. I actually don’t mind this – for me this show can co-exist quite happily independent of the book series. One “character” I do miss from the books is the sense of mysticism surrounding Cheyenne legends and beliefs. Although each television episode has had a small element of it, the books dwell much more on Walt’s spirituality as a part of his character; in the TV shows it’s more of a simple plot device, although perhaps this will be explored further in future episodes. On the whole, I’d say if you enjoy the books you will enjoy the series, if you don’t mind major plot deviations. Enough of the essential elements of appeal are present: characters, atmosphere, and setting. Craig Johnson seems to have nothing but good things to say about the show, and the TV series has boosted circulation of Johnson’s books. On his blog Johnson reports that the same folks who are “binge-watching” the series on A&E are going on to buy and “binge-read” the books in his series, and this must be very gratifying. 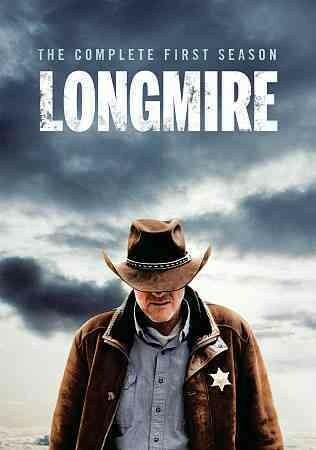 Give Longmire a shot! And check out Johnsons’ newest entry in the Walt Longmire series, Any Other Name. London, 1889. The city’s residents are frightened and demoralized by the crimes of Jack the Ripper, and Scotland Yard’s reputation has suffered as a result of its inability to capture the killer. The story opens on the scene of newly recruited Detective Inspector Walter Day and forensic pathologist Bernard Kingsley examining a corpse on a train station platform. The corpse turns out to be a fellow policeman, shockingly mutilated. Day soon finds himself heading up the investigation, supervising Scotland Yard’s recently formed “Murder Squad.” The reader is taken into the world of policing in class-conscious Victorian London and its overworked detectives, disrespected constables, and the nascent science of forensic pathology. The thoughtful and perceptive Day, and the detectives on his murder squad, examine the cases of the murdered Detective Little, trying to find some thread of a lead to grasp. As the murder squad pursues leads in the murder of their colleague, an ambitious and dedicated constable pursues the seeming accidental suffocation of a young boy in a chimney. The tragedy is a predictable outcome of the boy’s work as a chimney sweeper’s boy, yet Constable Hammersmith finds himself moved by pity and anger to pursue the facilitator of the child’s fate– against the orders of his superiors. He finds himself opening a very dangerous can of worms, which may or may not be related to Day’s homicide investigation. Jack the Ripper himself figures into this story, but not in the way you might think! You should check out this series if you enjoy the Victorian-era mysteries of Anne Perry. Grecian’s protagonists share their sense of justice with those of Perry’s detectives Thomas Pitt and William Monk. I was intrigued by the characters and their relationships. The character Bernard Kingsley is based on real-life forensic pathology pioneer Bernard Spilsbury (most famous perhaps for his work on the Crippen poisoning case). The forensics are one of the most intriguing aspects of the story. It is fascinating, for example, to see the general incredulity which greets Kingsley’s introduction of fingerprint technology into the case, something which today is taken for granted in criminal investigations. I was surprised to find out that the powerful character of Commissioner of Police Colonel Sir Edward Bradford is a real historical figure and portrayed very true to life. The relationship between Inspector Day, Constable Hammersmith, and Dr. Kingsley are developed in the second book in the series, Black Country, which I think I enjoyed even more than the first one. I’m greatly looking forward to the next entry in this series. Check the WRL catalog for The Yard as a book. Listen to The Yard on audio CD. We also have The Yard as an eaudiobook. I love Anne Perry’s books, so I was curious and at the same time hesitant to pick this up. Frankly, I didn’t want to be reminded that someone who created such likeable and morally upright characters as Thomas Pitt and William Monk was capable of a heinous crime, even if it did happen when she was practically a child. However, I also love true crime, so my curiosity won out. Some may be familiar with the story from the 1994 move Heavenly Creatures, starring Kate Winslet, which was based on the events of the crime (the movie’s release was what led to the revelation of Anne Perry’s identity). On a summer day in 1954 , when Anne Perry (then named Juliet Hulme) was 15, she and her best friend Pauline Parker brutally bludgeoned to death Pauline’s mother, Honorah, in a peaceful New Zealand park. The two friends had an intense relationship based on love of writing and the belief that they were geniuses who inhabited a special world in which only a select few were entitled to dwell. A lesbian relationship was speculated upon at the time, but Graham is noncommittal on this as a significant factor in the case, and Perry herself denied such a relationship. The motive for the crime appears to have been that the pair were about to be separated against their will by their parents. Peter Graham takes us through events leading up to the event and its aftermath in detail, giving users a fair perspective on the background of both girls and how it influenced their relationship and ultimately their crime. The girls were barely teenagers and obviously immature and detached from the reality of what they were doing—yet the brutality of the crime, and its level of premeditation, is chilling. One of the most fascinating parts of the book is the author’s look into the lives of the perpetrators years after the crime, after Anne Perry had become a household name. How does Anne Perry see those long ago events now? Her level of remorse and acknowledgement of responsibility do not seem to square with the facts as presented by the author, and although he does not pretend to have easy answers, he raises interesting questions which I thought about for a long time after reading the book. If you’ve ever read one of Anne Perry’s Thomas Pitt or William Monk mystery novels, you’ll know that although the revelation of the truth and pursuit of justice are paramount, it is often the case that the revealed killer and his or her motivations are portrayed with sympathy. It will be difficult for me to read one of Perry’s novels now without thinking about this dichotomy and how it relates to her own life. Check the WRL catalog for Anne Perry and the Murder of the Century.